Birth Date: April 11, 2016 PMY 1376D S A V 004 Predominant 4438 Peak Dot Predominant 351W Rose Of Peak Dot 864L H70 Quantock 1167T H70 Quantock 1 Ms 1274A H70 Quantock 18 Ms 1211W calving traits	maternal traits	growth traits	Fertility aod	ce	bw	adj 205 Dw	Milk/epd	ww/EPD	yw/epd	ADJ 365/Dw	S.S. Birth Date: April 16, 2016 PMY 1377D S A V Bismarck 5682 Standard Hill Yardstick 88Y Standard Hill Lady Ann 83U H70 Quantock 1211Y H70 Quantock 1211 Ms 1290A H70 Quantock 7204 Ms 1204X calving traits	maternal traits	growth traits	Fertility aod	ce	bw	adj 205 Dw	Milk/epd	ww/EPD	yw/epd	ADJ 365/Dw	S.S. Birth Date: May 17, 2016 PMY 1378D S A V Bismarck 5682 Standard Hill Yardstick 88Y Standard Hill Lady Ann 83U H70 Quantock 1211Y H70 Quantock 1211 Ms 1294A H70 Quantock 1167 Ms 1215X calving traits	maternal traits	growth traits	Fertility aod	ce	bw	adj 205 Dw	Milk/epd	ww/EPD	yw/epd	ADJ 365/Dw	S.S. Birth Date: April 15, 2016 PMY 1387D S Titlest 1145 Bar-H SBS Velocity 62B HF June 55W H70 Quantock 1246Z H70 Quantock 1246 Ms 1210B H70 Quantock 1 Ms 1056T calving traits	maternal traits	growth traits	Fertility aod	ce	bw	adj 205 Dw	Milk/epd	ww/EPD	yw/epd	ADJ 365/Dw	S.S. 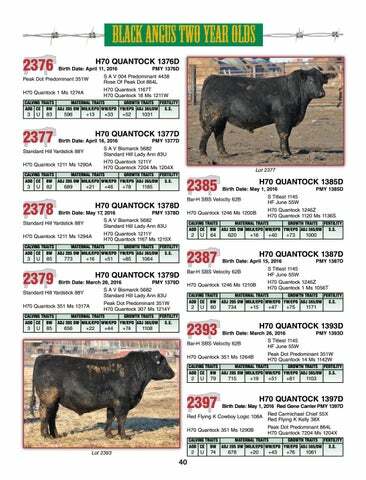 Birth Date: May 1, 2016 Red Gene CarrierPMY 1397D Red Carmichael Chief 55X Red Flying K Cowboy Logic 108A Red Flying K Kelly 38X Peak Dot Predominant 864L H70 Quantock 351 Ms 1290B H70 Quantock 7204 Ms 1204X calving traits	maternal traits	growth traits	Fertility aod	ce	bw	adj 205 Dw	Milk/epd	ww/EPD	yw/epd	ADJ 365/Dw	S.S.